Finnish mythology is a commonly applied description of the folklore of Finnish paganism, of which a modern revival is practiced by a small percentage of the Finnish people. It has many features shared with fellow Finnic Estonian mythology and other Uralic mythologies, but also shares some similarities with neighbouring Baltic, Slavic and, to a lesser extent, Norse mythologies. Of the animals, the most sacred was the bear, whose real name was never uttered out loud, lest his kind be unfavorable to the hunting. The bear ("karhu" in Finnish) was seen as the embodiment of the forefathers, and for this reason it was called by many circumlocutions: mesikämmen ("mead-paw"), otso ("browed one"), kontio ("dweller of the land"), metsän kultaomena ("the golden apple of the forest") but not a god. Cristfried Ganander's Mythologia Fennica, published in 1789, was the first truly scholarly foray into Finnish mythology. In the 19th century, research into Finnish folklore intensified. Scholars like Elias Lönnrot, J.F. Cajan, M.A. Castrén, and D.E.D. Europaeus travelled around Finland writing down folk poetry sung by runo (poem) singers, many of whom were tietäjät (traditional ritual specialists). The genres they collected included material like the synnyt, which give mythical accounts of the origins of many natural phenomena. From this material Lönnrot edited the Kalevala as well as the Kanteletar. The wealth of folk poetry collected in the 19th century often deals with pre-Christian pagan themes, and has allowed scholars to study Finnish mythology in more detail. The world was believed to have been formed out of a pochard egg. 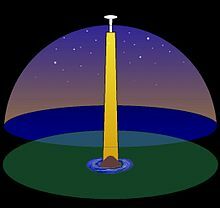 The sky was believed to be the upper cover of the egg, alternately it was seen as a tent, which was supported by a column at the north pole, below the north star. Birds also had other significance. Birds brought a human's soul to the body at the moment of birth, and took it away at the moment of death. In some areas, it was necessary to have a wooden bird-figure nearby to prevent the soul from escaping during sleep. This Sielulintu, "the soul-bird", protected the soul from being lost in the paths of dreams. Tuonela was the land of dead. It was an underground home or city for all the dead people, not only the good or the bad ones. It was a dark and lifeless place, where everybody slept forever. Still a brave shaman could travel to Tuonela in trance to ask for the forefathers' guidance. To travel to Tuonela, the soul had to cross the dark river of Tuonela. If the shaman had a proper reason, then a boat would come to take them over. Many times a shaman's soul had to trick the guards of Tuonela into believing that they were actually dead. Ukko ("old man") was a god of the sky, weather, and the crops. The Finnish word for thunder, "ukkonen" (little Ukko) or "ukonilma" (Ukko's weather), is derived from his name. In the Kalevala he is also called "ylijumala" (overgod, Supreme God), as he is the god of things of the sky. He makes all his appearances in myths solely by natural effects when invoked. Ukko's origins are probably in Baltic Perkons and the older Finnish sky god Ilmarinen. While Ukko took Ilmarinen's position as the Sky God, Ilmarinen's destiny was to turn into a smith-hero, or the god of the rock. In the epic poetry of the Kalevala, Ilmarinen is credited with forging the stars on the dome of the sky and the magic mill of plenty, the Sampo. Ukko's weapon was a hammer, axe or sword, by which he struck lightning. While Ukko and his wife Akka ("old woman") mated, there was a thunderstorm. He created thunderstorms also by driving with his chariot in clouds. The original weapon of Ukko was probably the boat-shaped stone-axe of battle axe culture. Ukko's hammer, the Vasara (means merely "hammer"), probably meant originally the same thing as the boat-shaped stone axe. While stone tools were abandoned in the metal ages, the origins of stone-weapons became a mystery. They were believed to be weapons of Ukko, stone-heads of striking lightnings. Shamans collected and held stone-axes because they were believed to hold many powers to heal and to damage. Lalli, Finn who slew St. Henry of Uppsala on the ice of Lake Köyliö, according to a legend. Menninkäinen, a fairy spirit, gnome, leprechaun of some sort. Vedenemo ("mother of waters") the Karelian Goddess of water of the Karelia region resembles a mermaid, with the body of a fish and the torso and head of a human woman. Like a Greek siren, she sings and seduces humans into the murky depths. Fishermen used to offer their first catch to appease Vedenemo, and spotting her was regarded as an extremely bad omen. Väinämöinen's great sword, which shines like the sun and is extraordinarily sharp.